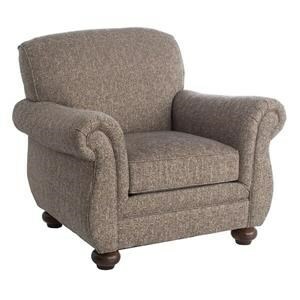 Contemporary with timeless details, this chair will only enhance your living room style. Modern elements such as curved track arms, boxed seat cushions and shaped legs create a unique and defined silhouette that will be admired by many while the tufted back and accent stitching add a touch of classic style. This piece is available in a wide selection of fabrics and leg finishes allowing you to create a chair unique to your style. 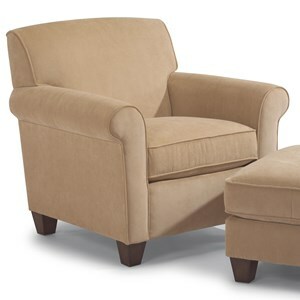 The Sullivan Contemporary Chair with Tufted Back by Flexsteel at Darvin Furniture in the Orland Park, Chicago, IL area. Product availability may vary. Contact us for the most current availability on this product. The Sullivan collection is a great option if you are looking for Transitional furniture in the Orland Park, Chicago, IL area. Browse other items in the Sullivan collection from Darvin Furniture in the Orland Park, Chicago, IL area.